Photo: Evan Saunders @ The Mancunion. Any mention of Palestine immediately brings to mind the conflict which characterises the region. Given these seemingly intransigent struggles, it is difficult to imagine the survival of loftier ideals like art and culture. 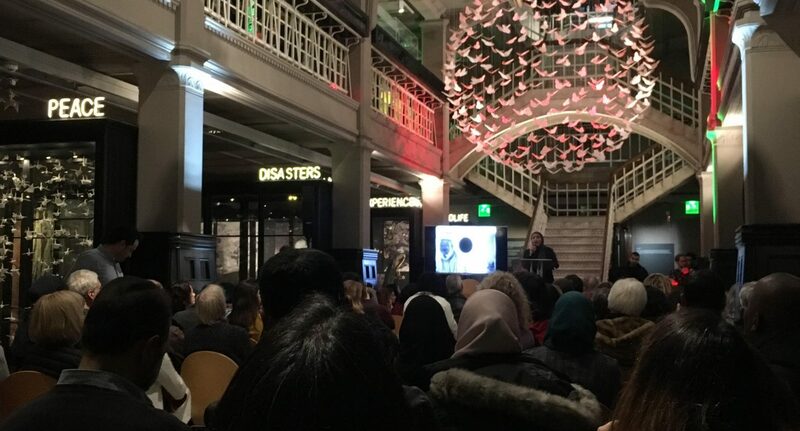 Yet this event at the Manchester Museum brought together academics and artists to showcase exactly how artistic expression is thriving amidst conflict. It soon became clear that despite the ostentatious setting, the event itself would be a little less well-presented. Even with the late start and short supply of seating, however, the audience was undeterred, craning their neck at the back or peering through railings on the second floor (as I found myself doing) to glimpse the stage. Former NUS President Malia Bouattia and current doctoral students at the University of Chester, Fadel Alsawayfa, and Muayyad Elwaheidi, started things off. They presented poetry and spoken word, interspersed with stories about daily life in Palestine. Bouattia performed “To Our Land” by prominent Palestinian poet Mahmoud Darwish, whilst Muayyad evocatively told of his torturous wait for permission from Israeli authorities to leave for England, before being given only one days notice to say goodbye to his family and friends. Respected artistic curator James Warmsley and current PhD student Beesan Arafat then showcased a variety of visual art. Work from contemporary artists like Larissa Sansour and Rana Bishara spanned photographs of cacti (a historic symbol of resistance in the region) to evocative geometric paintings. They serve as clear testament to a culture that persists in the face of existential threats. What quickly became evident was that this was not, and perhaps could not be, a demonstration of art alone. The Palestinian experience has become so characterised by struggle that it is now inseparable from conflict. Arafat, for example, recounted how patterns sewn into traditional Palestinian clothing came to reflect the colours of military badges from when Palestine was under British colonial rule – a reminder of our own role in the suffering. The event then moved upstairs for a performance of the celebratory folk dance dabke, accompanied by various traditional Palestinian pastries. There was no doubt that the four dancers from Hawiyya Dance Company, an all-female collective established in 2017, brought that sense of celebration. Spirited and lively, the pleasure the dancers took in their art quickly spread to the audience, who clapped and cheered throughout. A return downstairs saw Yemeni-Scouse poet Amini Atiq perform some of her work, before the arrival of a panel of speakers including rapper and activist Lowkey brought a more sombre mood. His firebrand speech dispensed with discussions of art and culture, instead explicitly denounced Israel’s illegal occupation of Palestinian territory and the British military-industrial complex. However, it was Dr Judy Price who best bridged this gap between art and politics when I asked what the role of young people could be in the ongoing discussion surrounding Palestine. She explained by saying that it’s “about experience… it’s really around friendships… that’s where solidarity is at its strongest,” a fitting explanation for the importance of the event itself. Art and culture are ultimately a way to share experiences and show solidarity, something that, despite the teething problems, this event did admirably for the Palestinian people.